AutumnFest, Smugglers' Notch Resort's fall program for families, keeps vacation fun alive even as the leaves begin to change color. From September 6 through October 10, 2005, Smugglers' offers its award-winning childcare, programming, and condominium lodging at the lowest rates of the year. The AutumnFest package includes morning childcare, called Kids' Connection, for offspring 6 weeks to 5 years old with the Resort's professionally trained staff at Treasures child care center. Little ones up to 16 months old can enjoy climbing structures, floor mats, spatial play, and outings and playgrounds. Those from 17 months to 3 years old spend time in the playhouse enjoying music, creating arts and crafts, singing, and listening to stories. Outside, they can enjoy the adjacent playground. The "seniors," from 3 to 5 years old, spend their time in indoor craft activities, story time, interactive play, playground fun, and swimming. A snack and lunch are included in this morning care. On Wednesdays and Thursdays Kids' Connection is expanded to full-day programs with lunch. This allows parents to venture further afield, perhaps to participate in a Resort-offered day trip or art class or to simply enjoy quiet time together at Smugglers'. 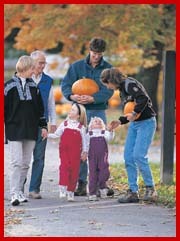 These two afternoons of extended child care are included in the AutumnFest package. "We added the afternoons to give parents additional flexibility to sample Resort activities such as massage, tennis, or arts and crafts. They'll also have time to explore the area around Smugglers' at one of the most beautiful times of the year," said Activities Director Marge McIntosh. Numerous local events occur in the fall, such as antiques and craft fairs, Oktoberfest celebrations, and concerts. Family Ties is a daily afternoon program for families with a different activity offered each day. The sessions serve all interests from arts and crafts to sports. In Junkyard Band, participants use household items to make one-of-a-kind musical instruments that they can play. A fun favorite returning from previous years is Creative Corner Puppets. All ages enjoy putting together a puppet with a distinctive look crafted from fabric, feathers and other supplies. Hiking enthusiasts may want to try the Nature Trek to explore the forests and streams bordering the Resort. A family of four can enjoy the AutumnFest lodging and activities package at Smugglers' for $420 for two nights in a one bedroom fully furnished mountainside condominium. For more information, call 1-800-451-8752 US and Canada, 0800-169-8219 UK, and visit smuggs.com .